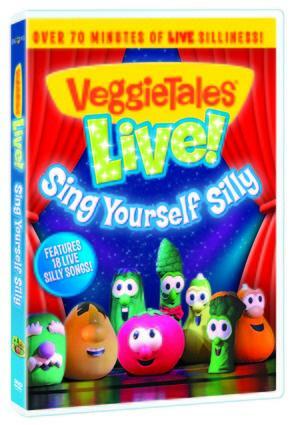 The Veggie Tales Live Sing Yourself Silly DVD is a combination of silly songs that includes country, rap, swing, opera, 1980s pop, and more, as well as important lessons. Veggie Tales are known for their faith-based educational stance and this DVD is no exception, and I had no qualms about turning it on for my daughter because I knew it'd be free of inappropriate language and themes that I didn't agree with. That said, it isn't overly preachy. It's a fun-filled 70+ minute video full of singing, dancing, and charming talking vegetables that younger children will love. My three-year-old enjoyed the whole DVD and said, "I love it! I like all the singing…and the dancing" about halfway through. She was completely enamored by the characters and asked if we could make a salad (bonus!). In many cases, when a DVD is playing, she will enjoy having it on in the background while she does something else, like destroy the living room. In this case, she sat perfectly still in my lap for the first half and moved to her miniature rocking chair for the second half. She even asked to watch it again. I have to agree with her assessment. From a parent's point of view, what's not to love? They teach lessons, like "It's great to share and have such wonderful friends," and the singing, dancing, and banter between the Veggie Tales cast and Susie the host are fun and entertaining. The whole show revolves around putting together an even better performance by working together as a team and sharing the show. There are Bible verses like Philippians 2:3, "Do nothing out of selfish ambition or vain conceit. Rather, in humility value others above yourselves." Some kids may not completely grasp the wording of the actual verses depending on their ages, yet what those verses mean is demonstrated throughout the performance so that young viewers can walk away with a moral lesson as well as new lyrics to sing. There are bonus features at the end of the video for additional fun. Kids get to watch what goes on behind the scenes. They can see the "rolling house" on the bus, dressing rooms, stretching, wardrobe room, and more. There are also ideas for sharing like donating money, toys, sponsoring a child, singing songs, and doing good for the community. These activities reflect the theme of the DVD, sharing. I love this DVD. It's entertaining and it reinforces the values that my husband and I try to instill in our daughter at home. She's learning lessons without realizing she's learning them. The show keeps her entertained when I need her out of my hair for a little while, but it's also fun to watch it with her thanks to the catchy songs and the characters' silly personalities.